Guest post by Jason Amunwa, who is a marketing consultant and designer at JaffyDesigns in San Diego, CA. He writes for marketing blog The Zest, loves talking marketing strategy and is suspicious of helicopters. About a week ago, I was hungrily feasting on Jay’s post about why info is only boring if we make it that way. It caused me to pause (mid-chew), and mentally scroll through a list of examples that fit his assertion that boring information is captivating when it’s humanized in some way. I blithely commented that online form-building app Wufoo.com is an example of this, but the more I thought about it, the more I realized Wufoo is in fact at the nexus of a number of significant and remarkable web trends, both emerging and well-established. So, gather round, kids, Grandpa’s gonna tell you a story about online forms: Years ago, the internet was home to herds of things called “Brochure websites” – we called them such in those days because they had no interactivity outside of the odd text link, or animated “Email Us!” GIF that would open your Outlook just a few minutes after clicking. Over time, some of the more web-savvy companies started offering online forms as a way to send them an email – now users didn’t even have to log into Hotmail to send a message! The method caught on, and soon, those with deep pockets could afford to hire developers to maintain these forms. But things kept speeding up – companies’ increasing customer data needs necessitated more complex forms, that were faster and more easily modified. It seemed that creating and editing these beastly things would always be a complex and expensive task until the arrival of the first online form generators, of which Wufoo was one. Ok, I’ll knock it off. Why is Wufoo special? To me, it’s one of a new breed of web services sitting squarely in the center of a number of different online trends, each of which are changing the face of the web, the way we use it, and even what we actually define as a website these days. Until Wufoo and its ilk came along, forms were strictly for coders. If you needed a new data field, a different validation rule or even just a field label updated, you had to prostrate yourself before them to get it done within the week, if you were lucky. I once had a developer quote me $10,000 to create a signup form. Don’t laugh – this was in 2007. They say that the hallmark of a maturing technology is that it gets easier to do increasingly complex tasks, and Wufoo does just that. 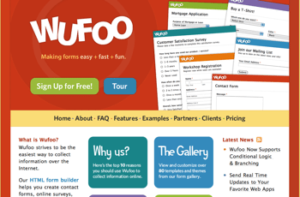 Wufoo and others (namely email service providers, like Constant Contact, etc.) pioneered the method of enabling website owners to embed the functionality of the service into their websites. We can now recognize this as the turning point where we saw web services evolve past the late 90’s/early Noughties era of destination portals to actually burrowing into, and gradually supplanting, the very infrastructure of the internet, as Twitter has done (credit Jeremiah Owyang for the sooth-saying on this one). As Jay discussed in his post, making a boring task fun will get you noticed far faster than making something that’s already fun incrementally funner, and web services are realizing this in their user interfaces. People notice drastic improvements where they’re sorely needed – just look at The Biggest Loser, and tell me if it would have been the same phenomenon had the premise been a bunch of skinny gorgeous people celebrating dropping a couple ounces of water weight? It’s allowing us to initiate and participate in complex social interactions en masse simply and instantly. The rise of the social media website plugin is allowing its functionality to metastasize across the web to become a part of the infrastructure – Facebook’s little announcement is the first of what will undoubtedly be many such initiatives to make social websites the default. It’s making social content sharing more fun. Disagree? Ask a newly-minted Foursquare mayor how they feel about it. Of these trends, the biggest is the embedding of services into online infrastructure, because the line of demarcation between your website and our social networks is going to get very fuzzy over the next few years. Agency sites like Modernista’s and Boone Oakley’s which were cutting edge in social media just scant months ago will increasingly become the norm among marketers. Which leaves us with a huge question: who owns the data generated by visitors to these “sites”?